Pick the perfect place to say "I Do"
Description: Buda UMC is the ideal space for brides looking to take a step back in time. Recognized by the Texas Historical Commission, this is oldest church in Buda, Texas. The quaint, picture perfect chapel is complimented with beautiful exposed trusses on the inside making it a memorable venue to host a charming, intimate wedding. Amenities: 2 indoor ceremony and reception spaces- historic chapel: renovated commercial kitchen, bridal suite, 2 rooms for wedding parties, court yard, beautiful oak trees; worship center: full kitchen, several rooms for wedding parties. Description: The Carrington is located in the historic downtown district in the heart of Buda, Texas. Just like its location, this venue has a historic, antique style perfect for brides looking for a vintage feel. It is the perfect boutique event venue for accommodating intimate weddings and family gatherings of up to 125. Amenities: Indoor/outdoor ceremony and reception space, bridal suite (4 bedroom suite with access to a kitchen, living room, private bathroom and private entrance), 2nd dressing area, prep kitchen, trash cans/bags, and on site venue manager; available to answer questions and for property maintenance. Description: The Coffee Grounds is an eclectic, yet casual venue perfect for a bride looking for a laid-back celebration. This venue is great for smaller, more intimate weddings. It will give any wedding the perfect mix of relaxation and comfort allowing for a more calm setting. Amenities: 5-acre compound, expansive outdoor patios and wooden decks, a 12,00 sq.ft. dance hall/event room, outdoor kitchen, BBQ smoker, catering kitchen, and a one-bedroom suite. Description: The Downtown Gazebo is bubbling with energy as the iconic center of historic downtown. Located on the downtown greenbelt, your wedding will take center stage while being surrounded by historic buildings and a backdrop of our beautiful heritage oak trees. Description: Garden Grove is pure elegance and luxury from the moment you step through the gates. The Mediterranean-style venue is an oasis of serenity in the heart of the beautiful hill country. It boasts lavish amenities perfect to accommodate any needs of both the wedding party and guests. Amenities: Indoor and outdoor event spaces with infinite uses, specialized areas for every facet of an event (including separate, personalized quarters for a bride and groom), full commercial kitchen with concealable catering area and state-of-the-art equipment, eco-friendly property (utilizing solar panels, green construction, purified water, recycling and composting at every event), and ADA-compliant facility. They also do "glamping" for guests. Description: The Lodge at Grace is the perfect blend of rustic charm and elegance. Adorned with natural landscape and fixtures, this venue is ideal for a Texas Hill Country wedding. It features multiple picturesque ceremony sites includes an extravagant indoor fireplace. Description: Le San Michele is the perfect location for the garden wedding of your dreams. On this venue sits a French villa overlooking pristine, manicured grounds. The space and its features allow for a range of wedding styles from classic to whimsical; any bride seeking an outdoor wedding can create the look they desire. Description: Onion Creek Senior Center is located near Downtown Buda, which is allows for easy access to all of Buda’s unique features. This venue is a blank canvas for a bride with any budget. The space is versatile and can accommodate ceremonies, receptions, rehearsal dinners, engagement parties, and bridal showers. Description: Fresh, clean, and sophisticated, Ranch 505 offers a contemporary style for a bride looking to impress. This space is perfect for a daytime wedding and transitions beautifully into the night. With twinkling patio lights and a beautiful glass disco ball, you’ll be ready to celebrate in style. Amenities: Indoor & outdoor ceremony and reception space, catering kitchen, serving area, mobile bar, bridal & groom suites, dance floor, and fenced-in outdoor area. Description: Ruby Ranch Lodge and Celebration Facility is perfect for those needing a venue with classic charm. This venue is rooted in history boasting Lyndon B. Johnson as one of its iconic guests. 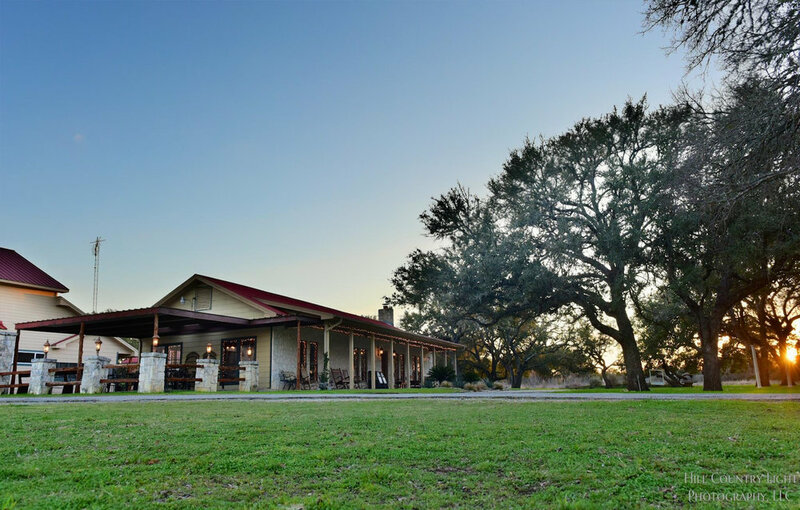 This venue is off the beaten path and provides a tranquil view surrounded by oak trees. Amenities: Two spacious event rooms (one with a rock fireplace, one with hand-milled accent walls), commercial kitchen, dining area, tables & chairs, pass-through bar, sound system, dressing rooms for wedding party, and lodging for 28 guests. Description: Historic Stagecoach Park Amphitheater is tucked in Historic Stagecoach Park and is brimming with natural beauty. This venue is small and quaint, the right size for those wishing to marry in front of only a few close guests. Its natural backdrop and simple style allows for couples to draft their dream wedding.